Liv Boudreau (#3) defended by Erin Leary (#13) in the first half. (Amesbury) Sometimes a soccer game turns on a goal, other times it turns on a save. North Andover goalkeeper Megan Collins denied a great scoring opportunity by Amesbury’s Hannah Zannini early (three minutes) in the second half and the Lady Knights (4-2-1) followed with three unanswered goals to defeat the Indians (3-1-1), 3-1, at Cashman Elementary School in Amesbury. Hannah Zannini gets off a 2nd half shot as her teammates watch from the sidelines. If Hannah’s hard shot doesn’t deflect off Megan’s hands AND the goal post, the Indians go up 2-0 and the outcome might have been different. But the shot stayed out and five minutes later Amesbury goalie Sarah Abraham gave up a rebound in front to Pam Coufos and she tied the score, 1-1. The visitors took the lead for good ten minutes later when a Alex Medlock cross from the right side found Jess Carney with an open look on the left side for the go-ahead, and what turned out to be, game winner. North Andover’s final goal was set up on a pass from Tori Sullivan into the middle where Caroline Kirby had time and a clear view of the AHS goal. 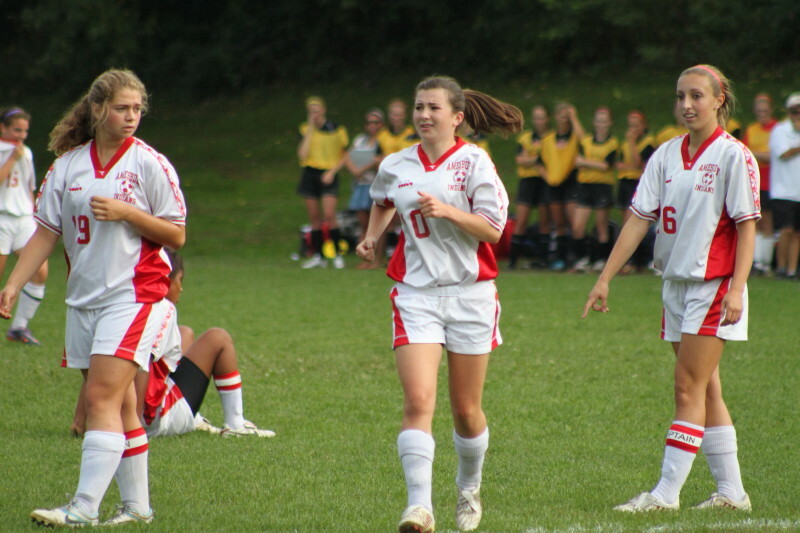 Pam Coufos (#2) scored the Lady Knights first goal. 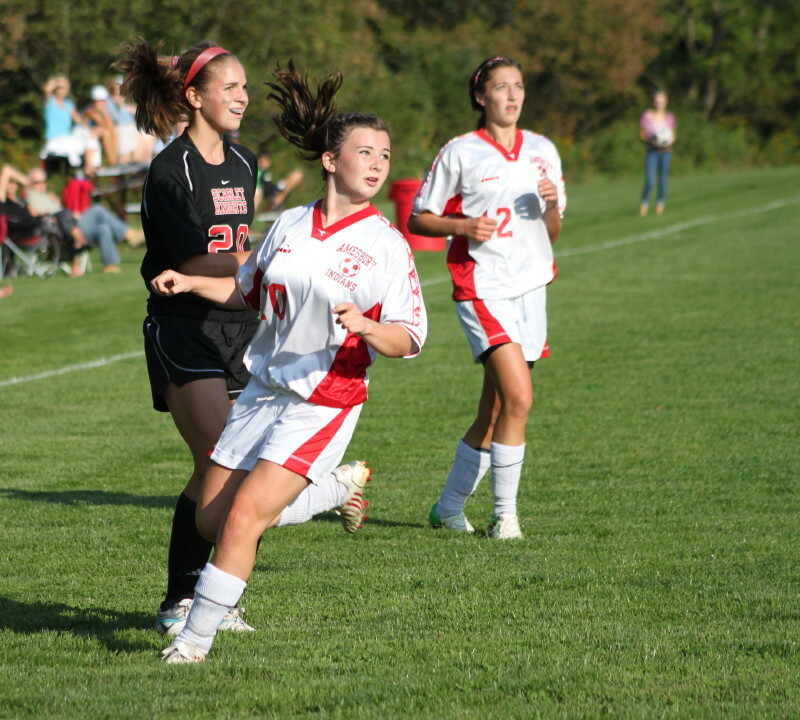 The lone Amesbury goal was by Hannah Zannini at the 28-minute mark of the first half. Erin Leary sent Hannah on a long run down the middle of the field. 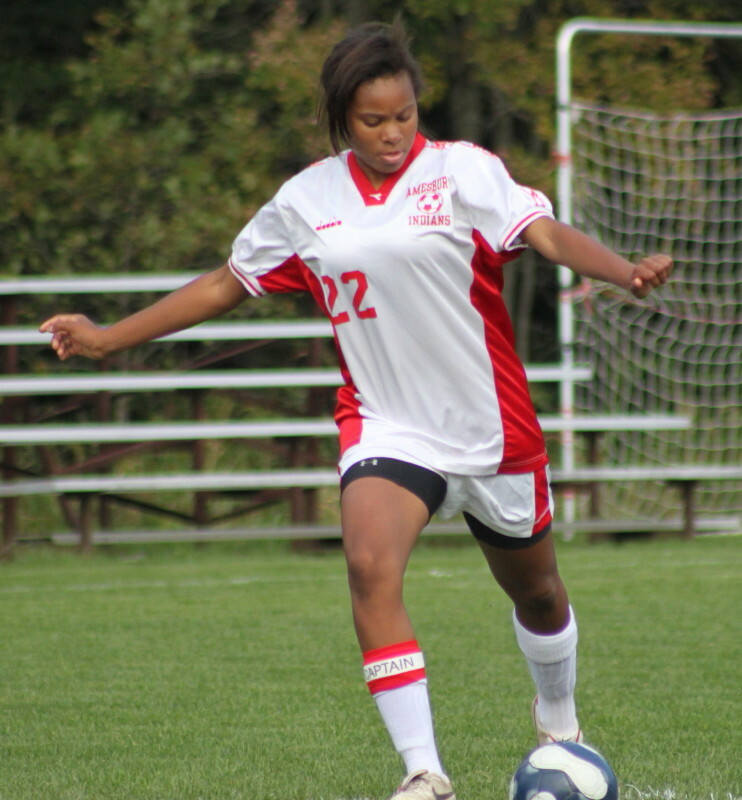 Hannah got off a strong right-footed shot that beat the NA goalie in the upper right corner of the goal. Whitney Whitlow (CAL All-League) hurt an ankle in the first half and played sparingly thereafter. 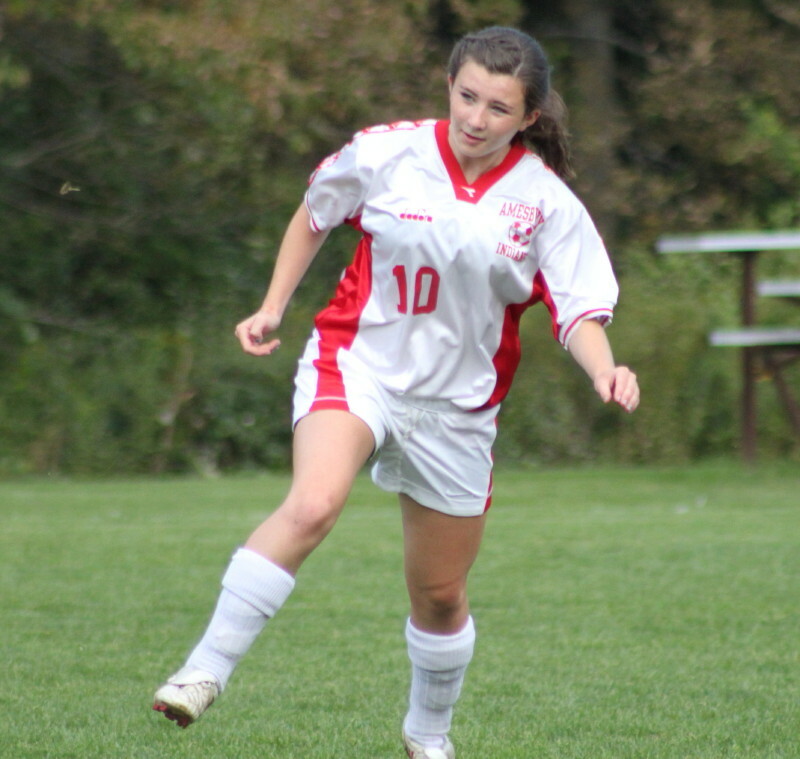 She had twelve goals and six assists in 2010. Megan Cullen (CAL All-League) damaged her knee in the summer and is out for the season. 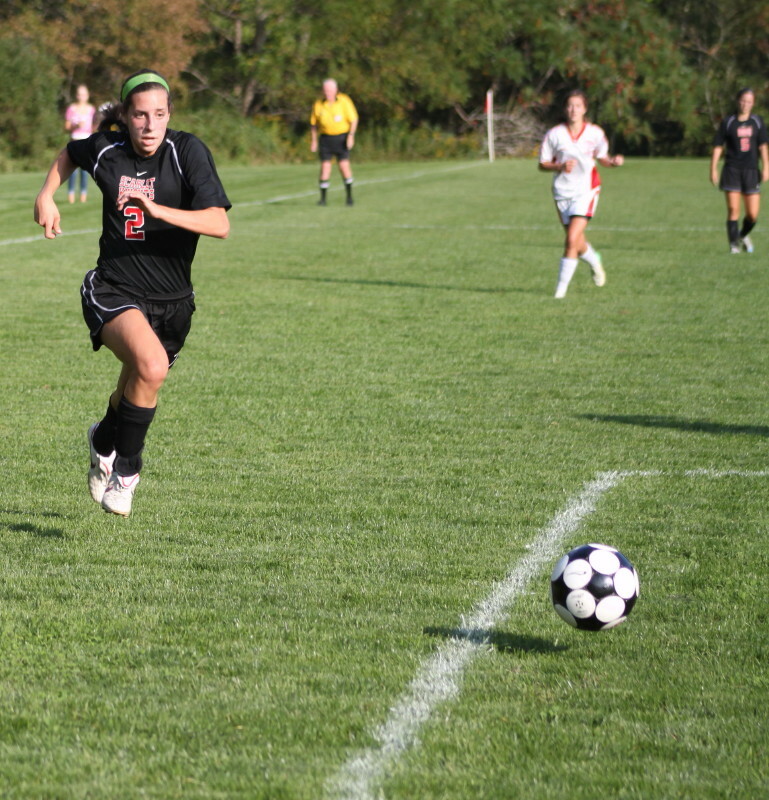 She had thirteen goals and nine assists in 2010. Let’s just say that Amesbury had some weapons missing on offense. But the Amesbury defense was together and they were tested by the quickness and persistence of CAL All-Leaguers Liv Boudreau and Pam Coufos among others. NA ended up with eleven shots by my calculations. 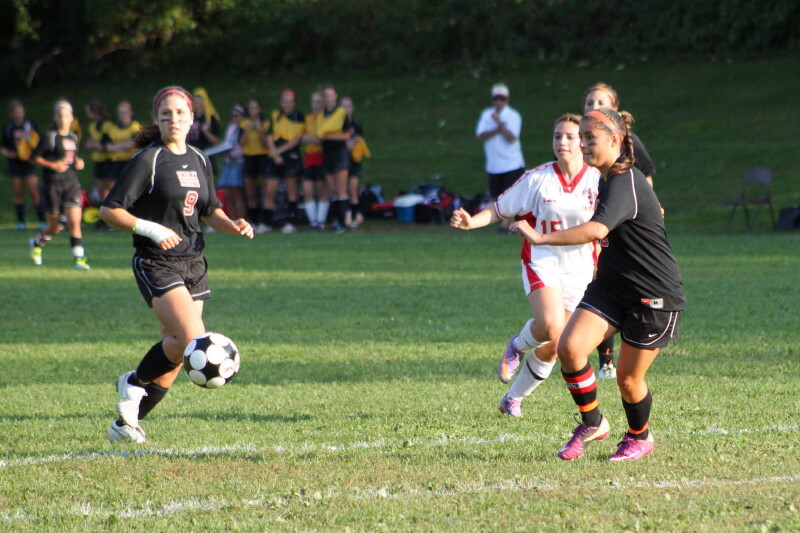 Amesbury had only allowed one goal through their first four games. The two best players on the field may well have been NA defenders Rachel Barnes (CAL All-League) and Taylor Tagliente (CAL All-Star). Rachel kept Indian threats out of the middle. Taylor went down heavily early on but shook it off and covered a lot of ground for the Indians. 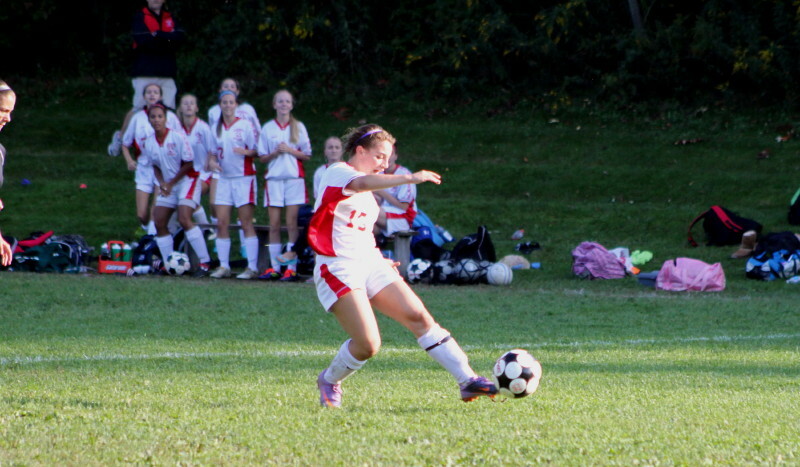 Taylor played every minute of every Amesbury game last year. 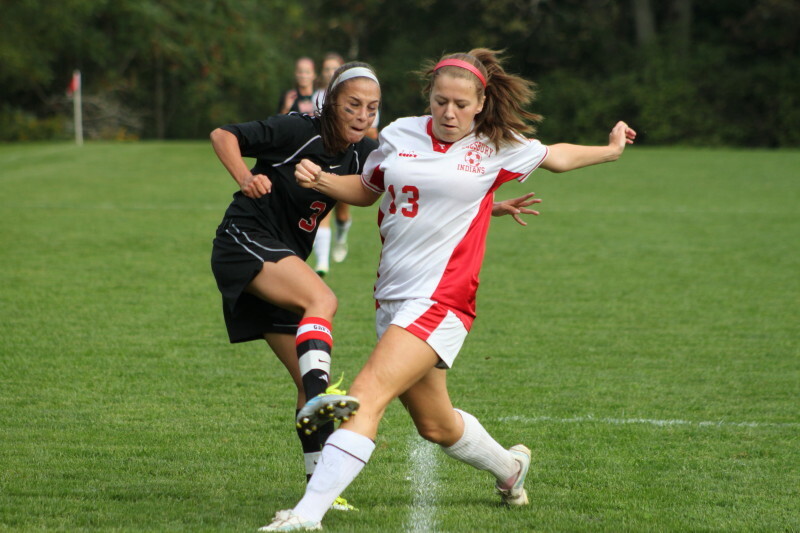 Audrey Samuelman (#9) and Rachel Barnes (back turned) defend in front of the North Andover net. Amesbury’s next game is against Hamilton-Wenham on Thursday at home. 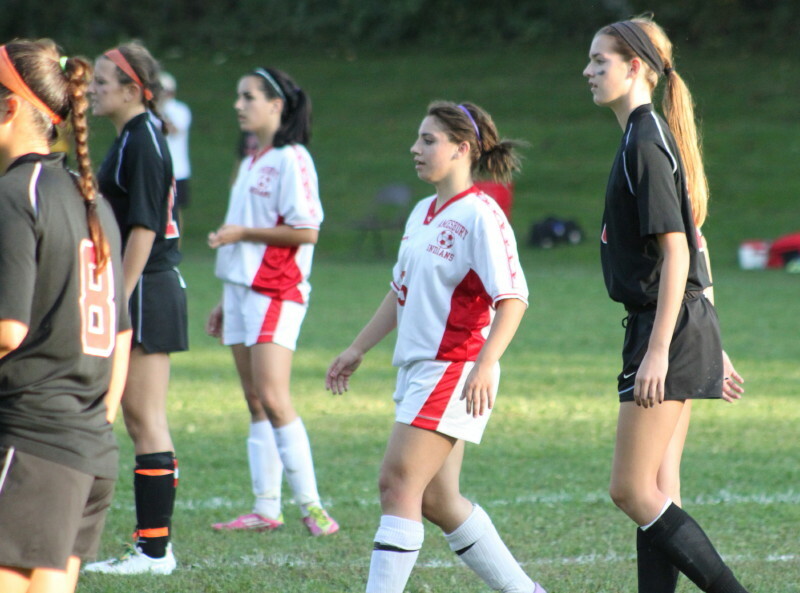 North Andover’s next game is home versus Pentucket. The field was in fine condition. The only problem was that the sun was a real factor down one end. As luck would have it, I chose to stay at the other end and naturally all four goals were scored down the sunny end. The pictures assume normal size if you click on them.